***CARIBBEAN 2300*** Ultimate offshore cruiser. This model is based on the legendary BERTRAM 23 hull and believe me the ride is head and shoulders above the rest! This model has it all as it maximises on deck space with 2.5mtr beam but can be towed around town with no need for a permit. With moulded hardtop and overhead console. BIG V berth, toilet, adjustable bucket seats, ice chest, storage pedestal modules, underfloor & fish storage lockers etc, etc you will be hard pressed finding anything that comes close to this package. Note: This above / noted base price is for BOAT ONLY EX FACTORY, PLUS ENGINE/S, TRAILER and OPTIONS. Your choice of engine/s to 300hp max. ( single or twin) You choose engine brand, or may choose to take your boat away and get the engine fitted yourself? Bait tank in transom, large dash arrangement to cater for modern large screen electronics and a transom that can accommodate a single or twin outboard installation up to a max of 300hp. With 420ltr of fuel capacity and 77 ltr or water, range certainly wont be a problem either!!. 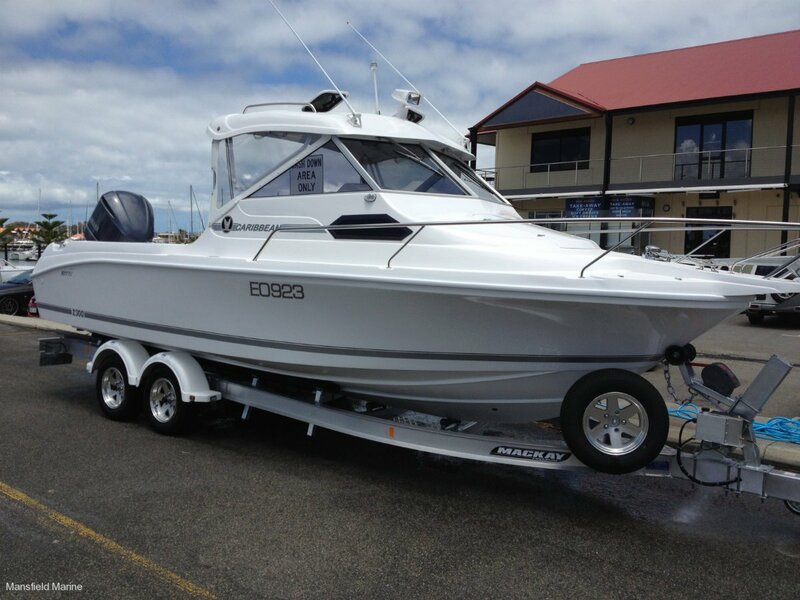 MANSFIELD MARINE specialise in fully customising all of our boats to suit the owners exact needs. If you are new to the boating market place then please note that the CARIBBEAN brand is iconic for numerous good reasons. With the builders International Marine in Melbourne having built more than 50,000.00 boats in 50+ years. They have perfected construction techniques and lead the way when it comes to designing the best bluewater capable hulls, based on the BERTRAM hull, they ride softly, are stable at rest and seem to always have the room in the right places. If you are a seasoned boatie then you already would know the CARIBBEAN qualities and why the brand has stood the test of time. Coby Mansfield on 0418958658 to arrange a time to view at our Wangara pre-delivery center. * NOTE PLEASE: BASE PRICE LISTED HERE IS FOR BOAT ONLY. IE, PLUS DELIVERY, PLUS TRAILER, PLUS ENGINE AND ACCESSORIES. Base drive away packages from $124,500.00 with 200hp 4 stroke engine ( apx 34 knots) and Aussie built electric braked trailer. BIG fwd V berth, with optional BUNK INFILL cushion option. WHAT A BOAT!!! Amazing ride, great value, AUSTRALIAN made and exceptional resale value. Why would you choose anything else? We can customise a New 2300 to suit your exact needs.